The FINRA CEO also told ThinkAdvisor at a SIFMA conference that "CARDS as it exists now is unlikely to move forward." 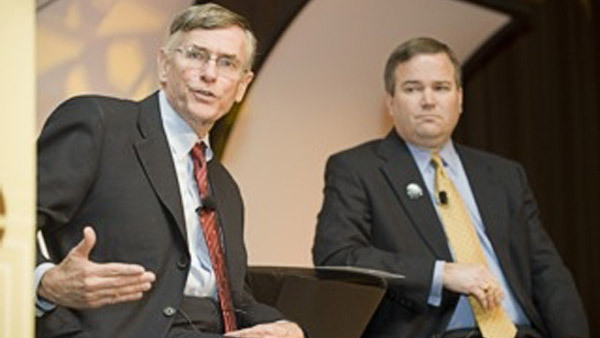 FINRA CEO Richard Ketchum, left, with FSI CEO Dale Brown. The Financial Industry Regulatory Authority is ready to push ahead with a new iteration of its broker recruitment compensation rule, is expecting by summer a report from its Arbitration Task Force, is looking to “diversify” FINRA’s arbitration pool, but is still getting feedback on its Comprehensive Automated Risk Data System proposal, or CARDS, Richard Ketchum, the self-regulator’s chairman and CEO, said Monday. In a question-and-answer session with Ira Hammerman, the Securities Industry and Financial Markets Association’s executive vice president and general counsel, at SIFMA’s Compliance and Legal Seminar in Phoenix, Ketchum said that FINRA has “a good deal of road to travel” in determining what the newest version of its CARDS proposal should look like, as the self-regulator is still getting feedback on it. The controversial CARDS plan would be a rule-based program that would allow FINRA to collect — on a standardized, automated and regular basis — account information, as well as account activity and security identification information, from firms. Ketchum was scheduled to testify before the House Financial Services Committee on Thursday regarding the CARDS plan, but that has been postponed. Ketchum said his testimony would likely be rescheduled in late spring. Ketchum said in moving forward, FINRA is “very sensitive” to the cyber threat and “re-enginerring risk” risk concerns that have been raised regarding the other CARDS proposals. “We’re not going to move forward with anything that has material risk,” he said. FINRA’s recently formed Arbitration Task Force will likely provide its first report on ways to revamp FINRA’s arb process this summer, Ketchum said during the Q&A. “We tried to emphasize that there is no question off the table, so I hope we’ll see a report this summer, and we’ll take them very seriously.” The self-regulator is also looking to “increase steadily the diversity of FINRA’s arbitration pools. We will “do a lot more arbitration recruitment to make sure the pools are more diverse,” he said. FINRA has been recruiting arbitrators from more than 100 groups of women and minorities. FINRA issued for public comment on Sept. 22 a proposal that curtails its earlier draft rule requiring, in most cases, disclosure of recruitment bonuses and incentives. The proposal would require recruiting firms to provide a FINRA-created educational communication to former retail customers of a transferring representative who are considering transferring assets to the rep’s new firm. “Our thought would be a consistent disclosure document for all firms,” Ketchum said at SIFMA event last November. “We don’t want to do anything that discourages competition,” he said, “but we want to ensure that customers can ask and think through the right questions” regarding the costs they may incur, investments that may not be transferrable, as well as the financial incentives the broker is receiving when shifting to another firm. — Check out All Eyes on SEC Chief to Move Fiduciary Forward, FINRA’s Ketchum Says on ThinkAdvisor.